Is Private, InCognito Browsing Really Secure? Although browsers provide incognito modes for private browsing but it does not mean that your jog through cyberspace is absolutely without footprints. Browsing History: Web browsers keep track of webpages that you visit. If you need to revisit a webpage –browser offers you the address of that page from history. Auto-complete: When you fill forms on websites, browsers keep track of the information you fill in. Next time, while filling same or similar form, browser will help you with suggestions. Cookies: In cookies, a browser can store a variety of information about your actions on a website. For example, if you were reading a book online, the website can store the page number where you left reading last time. Upon your return, website can take you directly to that page by reading information from cookie. File Cache: To increase the speed of browsing, web browsers download and store a lot of images and other files in your computer. When you visit the previously visited pages browser may load the required images from your computer instead of repeatedly fetching them through Internet. Therefore, even if you surf in private mode of a browser; it does not mean that you are leaving absolutely no traces of your surfing. 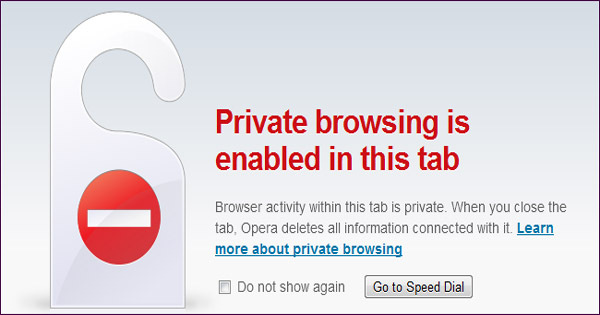 Private modes only stop browsers from storing information. That is to say that anyone using the same computer will not know what you surfed in private mode. Therefore, it is strongly advised that you clear the data after doing your work on a public computer. Private mode does not, however, prevent websites from tracking and storing information. For example, if you go to a website in private mode –your browser will not store the website’s address in its history. But that website’s server may record your IP address and addresses of pages that you surfed on that website. Nowadays, many big Internet companies make huge bucks by tracking user’s surfing habits online and use this information for different purposes. Companies like Google, use this information in order to deliver more precise advertisements to you. Your Internet Service Provider (ISP) also knows what you are surfing because all the web pages that you see come through your ISP’s server. Therefore, although private browsing makes it difficult for laypeople to see your footprints but more tech-savvy, authorities and the owners of the websites that you visit do know about your surfing. Last updated: 23 September 2017 | Published on: 15 October 2012 | Authored and Edited by: Lalit Kumar and Team | Filed as: Home » Miscellaneous » Is Private, InCognito Browsing Really Secure?